I've had an interesting experience in the second level of art. 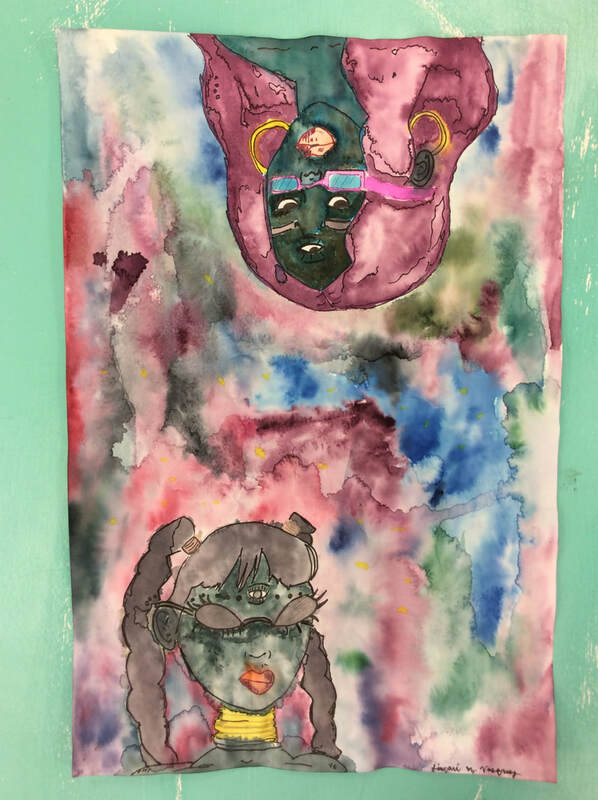 I've enjoyed every art piece I've created but if I had to choose three it would be these pieces: Colorful Dancing, Kylie Jenner, and Intergalactic Women. Each of these pieces showed how much I grew as an art student in each phase of different chosen art packets. A media that I enjoyed working with this semester was collage for my Colorful Dancing piece which was assigned to the figure packet. I wanted to be able to incorporate a series of different ballerina dance positions in a variety of different shapes and sizes, in a collage format. I liked it because it was very easy to create and the process of fun. A project in which I felt I overcame obstacles with was my Intergalactic Women piece which was assigned to the imagination packet. I wanted to be able to create alien women with a galaxy in the background. When messing with the water color paint, it was pretty difficult due to how much the colors began to overlap, but I learned how to incorporate new idea throughout the process of creating this piece and it came out to look absolutely breath taking--in my opinion. 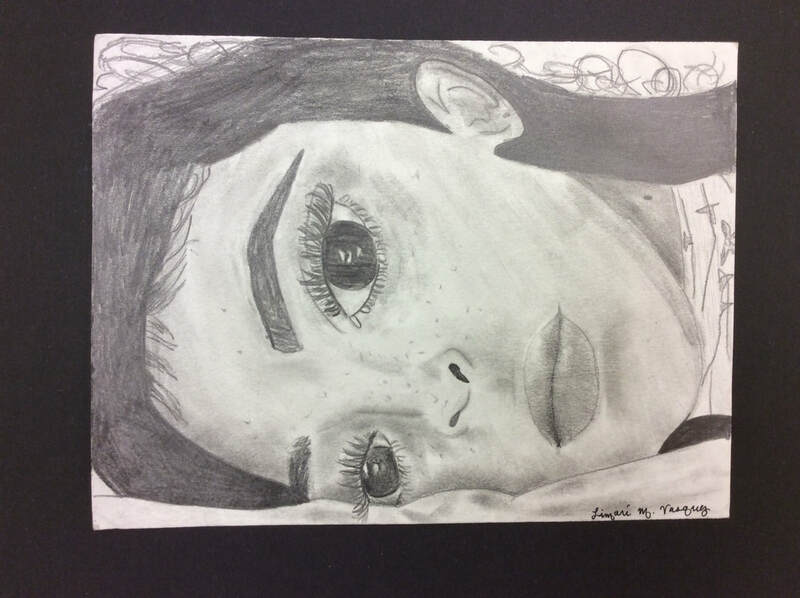 Lastly, a media that I enjoyed working with this semester was with graphite for my Kylie Jenner piece which was assigned to the portrait project. I liked using it because it really brought out so much detail to this piece and made it look so realistic when it came down to facial features. Art helped me grow artistically in so many ways. This semester was such a fun learning experience. Art can be anything really-as long as it has some kind of meaning behind it. In this case I decided to let my hands do all the work-what I mean is I just created whatever came to mind and kept building and creating until I was satisfied. I decided to create abstract art. I went onto Pinterest to get inspired by images that I came across. I was inspired by many so I decided to create an art piece based off of a variety of shapes and designs. I didn’t necessarily sketch out my thought process- I wanted to create whatever came to my mind working on my piece. I came to an agreement with my art instructor to create my art piece from clay-to step outside of my comfort zone. Before scorching and slabbing my pieces together I made sure I was satisfied with where/how my pieces were going to be aligned. Throughout the process of creating this art piece, I struggled a lot because the pieces were either too big or thick to stick upon my base. At times I just wanted to quit and create an abstract piece with paint or pastel. I will admit I had some difficulties with creating abstract from clay but I enjoyed the process of it all. I probably would do something like this again. “Art enables us to find ourselves and lose ourselves at the same time” is what Thomas Merton once said. My partner, Lindsay, and I wanted to explore the different mediums of art and we decided that we wanted to create an art piece that consisted of photos within the category of conceptual art. Creating this work made me learn about how individuals view themselves in today’s society. We got curious as to what conceptual art actually was- I then furthered my research into looking into what conceptual art in photography looked like. I was absolutely drawn to the message(s) portrayed throughout the photos I found. I wanted to be able to create my final art piece using/expressing messages such as the ones shown on the right. Once I finally decided on what/how I wanted my final art piece to be, My partner and I wanted to be able to pull students from the VMCCA community and propose our idea to them. We wanted to them to explore what they thought self beauty was and we wanted them to decide between if they wanted to wear a mask, label themselves in index cards, or use posters in the pictures we would take of them, to be able to express to the VMCCA community who they were and how they feel about themselves- self discovery. 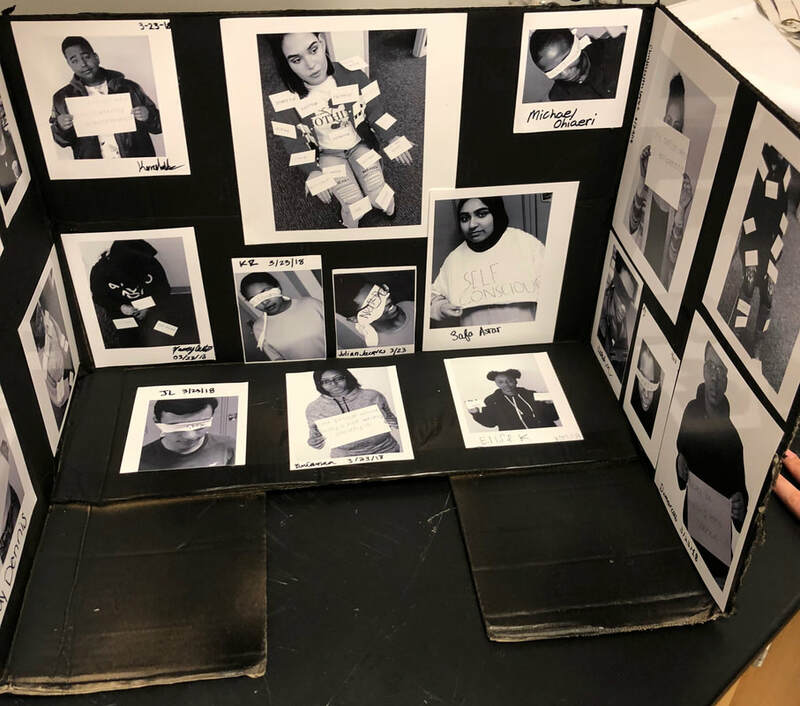 During the creative thinking process my partner and I decided to use a cardboard box, spray paint it, and display the photos of the individuals in the VMCCA community on that box using hot glue. We wanted it to be something unique, original, as well as something many people don’t usually see on a day to day basis. Overall, I loved the outcome of our product and the process it took before completing this piece. Art is a form of my self expression, an escape from everything- school, work, home, LIFE! This particular art piece helped me to understand the concept of using watercolor and knowing exactly how much to apply on your piece. I decided to create my next art piece based on the Imagination packet. I wanted to create something that gave off a galactic feeling, something out of this world in a way. I began my search on Pinterest and came across several images of alien girls and I looked on Google for a painting of the universe to go along with my two inspirational images, and came across the image of a galaxy. I knew right away how I wanted to create my next art piece. After searching for imagination art ideas, I finally decided to set my mind to creating an art piece that consisted of a galaxy background with two aliens in the setting. I quickly sketched an idea of how I wanted one of my aliens to look like in my final art piece. Throughout the process of creating this art piece, I got to experiment with watercolor paint for the first time. Originally I wanted to color in my aliens with a chalk pastel, but as I began to progress on with this art piece I set my mind to filling in the characters with water color as well and outlining each of them and their characteristics with a fine tipped permanent marker to make each of them stand out. When using watercolor paint for my art piece, I learned how to use the right colors as well as how much water to apply before applying the paint on top. I really enjoyed using this medium and I enjoyed the process it took to create this art piece. My inspiration comes from how much I admire Kylie Jenner. I’ve never really been fond of art, and it’s not really my go-to as a hobby, but when I do create art pieces I tend to surprise myself as well as others. I have learned many new techniques in art throughout many of my art pieces I’ve created from the time I’ve spent in Art & Design Studio I and recently II. Art stresses me out sometimes, but the outcome of it and the class itself, I have to say, is really enjoyable. When I chose to create an art piece based on the Portrait Packet, I began to brainstorm ideas. I went to Pinterest and began to pin images of Instagram famous models I can draw and then I came across the famous Kylie Jenner. When I began to look at images of Kylie Jenner, I came across one particular one that really drew my attention, which was a selfie, all natural, no makeup, of her laying down (shown on the right). So when I finally decided that I wanted to draw Kylie Jenner, I immediately began to draw on a final paper. I figured it wouldn’t be so difficult to do so because in the Portrait Packet, through the tutorial videos, I learned to always draw lightly when drawing a self portrait, so that’s exactly what I decided to do. I made sure to capture every little detail of Kylie Jenner, from her false eyelashes, to her freckles, to the little strands of hair sticking up. Throughout the process of this art piece, I learned how to work with graphite and knowing exactly how dark or light to shade in certain areas of my Kylie Jenner portrait. I also learned how to draw realistic human characteristics in the process of creating my art piece. I finally learned how to draw a portrait of another individual. This is definitely one of my favorite pieces I’ve created thus far. During the process of creating my piece, I was really impressed on how good I can be with gesture drawing- on my first try! I wanted my final art piece to have something that included dancers, so I chose to draw ballerinas. Creating this work made me feel engaged in something I’ve never tried before- gesture drawing. At first,I was having trouble with how to come up with a final idea/product that had an input for gesture drawing. This caused me to do research and as I began to research “gesture drawings”, a lot of gesture drawings dealt with dancers so I made a final decision on using ballerinas for my final product. I was going for more of a collage of ballerinas overlapping each other and then adding color towards the end. As I made a decision on how I wanted my final piece to look, I first brainstormed in my art book and then I began to draw out my final idea on a poster. I made sure that each of my drawings were very detailed. In the process of creating my final art piece, as I stated earlier, I finally learned how to draw with gesture drawing on my very first try. I grew artistically because my drawings were detailed when it came down to how each ballerina danced, along with their arm and leg positions. I really am impressed with the outcome of this art piece. My name is Limari Vasquez and this is my second year in taking art at VMCCA. I really enjoy experiencing with new techniques in art and I really enjoy creating art because I get to freely express myself through art.